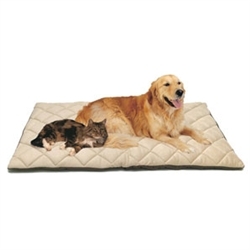 The Flectabed Q Quilted Heat Reflective Thermal Bed by Petlife is thermal bedding for your pet with a super soft quilted exterior. Trapping Air - using the multi-layered fibres to trap air within the fabric, which naturally warms the bedding. Flectabed Q Quilted Heat Reflective Thermal Bed by Petlife is particularly suitable for pets who suffer from arthritis, young and ill pets or just those that enjoy the extra warmth provided.